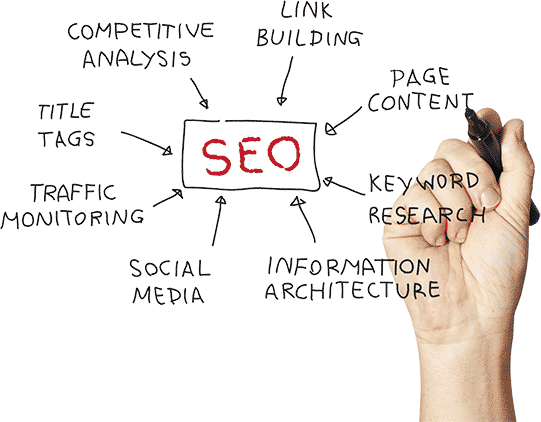 Search Engine Optimization (SEO) is the most cost effective way to bring business to your website. Boston Web Marketing has helped countless businesses utilize Google AdWords to increase their visibility and generate more leads online. Need an updated look or simply need a website? Boston Web Marketing has many options for designing your new website. Boston Web Marketing has social media experts on staff who specialize in managing your social media presence. Search Engine Optimization is the culmination of numerous online efforts that together contribute to the overall goal of increased traffic to your brand’s website. Analyzing your brand, developing business-related keywords, utilizing social media and working to remain in sync with Google’s latest algorithm and expectations are just some of the key steps that must be executed in order for companies to achieve their desired visibility. Patient and focused commitment to each step of the SEO process will create what every company strives for: a powerful and sustained online presence and the ability to successfully deliver their brand’s message. Why Choose Boston Web Marketing? Your dedicated Boston SEO Account Rep will guide you through our process and keep you up-to-date on website traffic, social media insights, and organic results. Every piece of content is completely custom to your business, helping to set you apart from the competition. We provide our clients with detailed Analytics reports which fully discuss conversions, sessions, organic ranking, and more. By aligning your keywords to match your business goals, we can help you refine your traffic and choose keywords that make the most sense. Real time search and traffic data at your fingertips so you can always see the latest numbers & statistics for your website. A registered Google Premier Partner, we helped countless businesses utilize Pay-Per-Click (PPC) marketing to increase their visibility & generate more leads. Highly professional and top level web marketing company. "Our website redesign came out amazing and our SEO and Adwords campaigns have proven to be successful." “From social media optimization, PPC management and Google adwords management to web site design. The team at Boston Web Marketing has always backed up their services with quantifiable metrics." First class organization that delivers results! "A good SEO company is hard to come by. It can be difficult to hire a web development firm if you don't speak the language of SEO. The solution is Boston Web Marketing."